Farruquito has flamenco in his blood: his grandfather was the dancer El Farruco, his mother La Farruca (who, according to tonight’s programme, danced for as long as she could “during all her pregnancies”), and his father was the singer El Moreno. 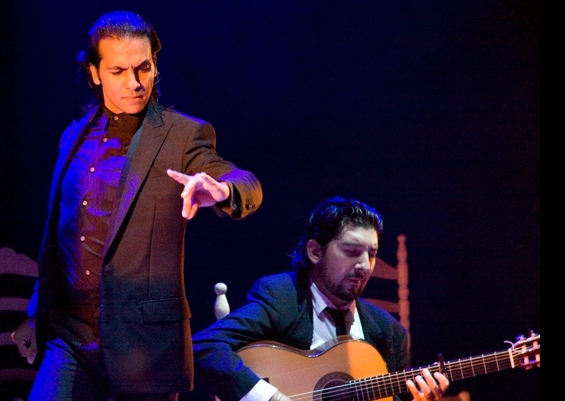 For his show Buen Arate, he has invited his younger brother – a dancer and musician also called Farruco – to join him in an evening that proposes to journey back into the very spirit of flamenco. In fact, the performance reveals the primacy of a different artistic bloodline: music, which is said to be the ancestor of the dance. Many of the high points of the evening are largely or solely musical, rather than choreographic. The opening number shows well how flamenco music bewitches the listener, with its layers of rasping harmonies, its rhythmic irregularities and restless melodic lines. Farruquito’s appearance, first stalking then stamping, feels almost like an intrusion into this sonic world, and he struggles to establish his presence within it. When Farruco arrives, the brothers preen and posture in displays of oneupmanship, circling each other like cockerels. They’re both highly skilled with their footwork, though Farruquito’s more responsive upper body gives him the edge. Yet the very next number, a mesmerising dialogue between two male guitarists backed by stuttering handclaps, makes the brothers’ duet look crude by comparison. The music has more art, less ego. The dancing becomes more satisfying later on. If Farruco tends still to front more than follow the music, Farruquito grows more attentive. He taps his heart to the pulse and interacts more subtly with two singers, letting their voices coax him into physical response, so that when he finally breaks into snare-drum stamps and rattles, both music and dance seem to have emerged from the same source. All in all, it’s a patchy though certainly stimulating evening; the performers who most snagged my attention were singer Encarna Anillo and guitarist Román Vicenti.